There is an increased risk of endometrial cancer in a woman with a uterus who uses unopposed estrogens. Adding a progestin to estrogen therapy has been shown to reduce the risk of endometrial hyperplasia, which may be a precursor to endometrial cancer. Adequate diagnostic measures, including directed or random endometrial sampling when indicated, should be undertaken to rule out malignancy in postmenopausal women with undiagnosed, persistent or recurring abnormal genital bleeding [see Warnings and Precautions (5.2)]. Estrogen plus progestin therapy should not be used for the prevention of cardiovascular disease or dementia [see Warnings and Precautions (5.1, 5.3), and Clinical Studies (14.2, 14.3)]. The WHIMS estrogen plus progestin ancillary study of the WHI reported an increased risk of developing probable dementia in postmenopausal women 65 years of age or older during 4 years of treatment with daily CE (0.625 mg) combined with MPA (2.5 mg), relative to placebo. It is unknown whether this finding applies to younger postmenopausal women [see Warnings and Precautions (5.3), Use in Specific Populations (8.5), and Clinical Studies (14.3)]. These highlights do not include all the information needed to use MENOSTAR safely and effectively. 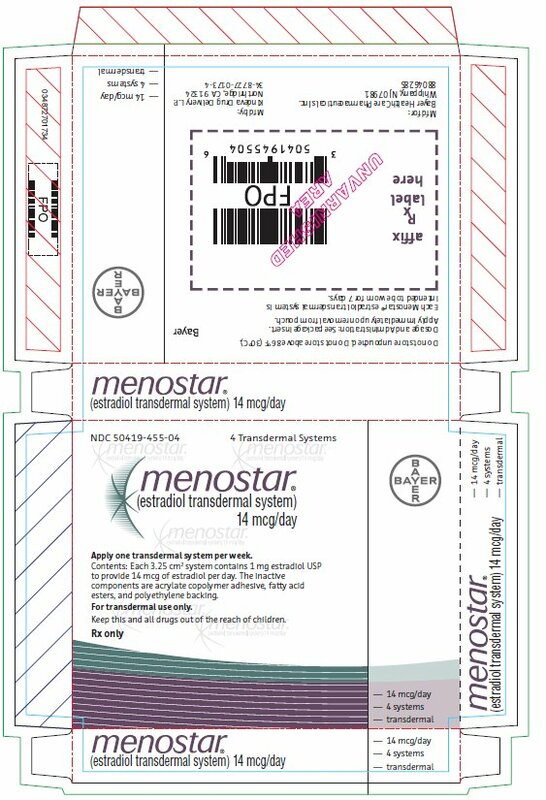 See full prescribing information for MENOSTAR. Generally, when estrogen is prescribed for a postmenopausal woman with a uterus, a progestin should also be considered to reduce the risk of endometrial cancer. 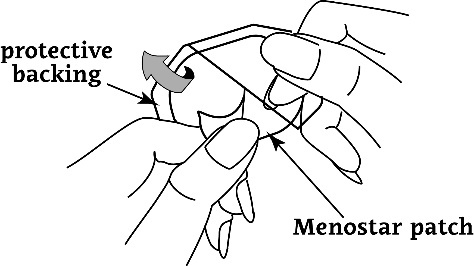 It is recommended that women who have a uterus and are treated with Menostar receive a progestin for 14 days every 6 to 12 months and undergo an endometrial biopsy at yearly intervals or as clinically indicated in order to detect any endometrial stimulation which might require further clinical action. A women without a uterus does not need a progestin. In some cases, however, hysterectomized women with a history of endometriosis may need a progestin [see Warnings and Precautions (5.2, 5.14)]. Application to areas where sitting would dislodge Menostar should also be avoided. Swimming, bathing, or using a sauna while using Menostar has not been studied, and these activities may decrease the adhesion of the system and the delivery of estradiol. 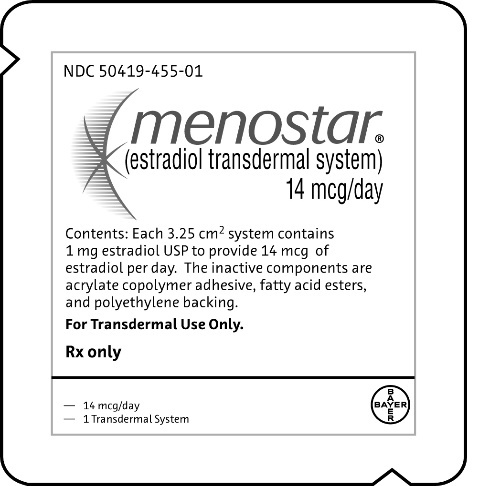 Menostar (estradiol transdermal system) 14 mcg per day - each 3.25 cm2 system contains 1 mg of estradiol. In the WHI estrogen plus progestin substudy, a statistically significant increased risk of stroke was reported in women 50 to 79 years of age receiving daily CE (0.625 mg) plus MPA (2.5 mg) compared to women in the same age group receiving placebo (33 versus 25 per 10,000 women years) [see Clinical Studies (14.2)]. The increase in risk was demonstrated after the first year and persisted.1 Should a stroke occur or be suspected, estrogen plus progestin therapy should be discontinued immediately. In the WHI estrogen-alone substudy, no overall effect on coronary heart disease (CHD) events (defined as nonfatal MI, silent MI, or CHD death) was reported in women receiving estrogen-alone compared to placebo2[see Clinical Studies (14.2)]. In the WHI estrogen-alone substudy, the risk of VTE (DVT and PE) was increased for women receiving daily CE (0.625 mg)-alone compared to placebo (30 versus 22 per 10,000 women-years), although only the increased risk of DVT reached statistical significance (23 versus 15 per 10,000 women-years). The increase in VTE risk was demonstrated during the first 2 years3[see Clinical Studies (14.2)]. Should a VTE occur or be suspected, estrogen-alone therapy should be discontinued immediately. In this substudy, prior use of estrogen-alone or estrogen plus progestin therapy was reported by 26 percent of the women. The relative risk of invasive breast cancer was 1.24, and the absolute risk was 41 versus 33 cases per 10,000 women-years, for CE plus MPA compared with placebo [see Clinical Studies (14.2)]. Among women who reported prior use of hormone therapy, the relative risk of invasive breast cancer was 1.86, and the absolute risk was 46 versus 25 cases per 10,000 women-years for CE plus MPA compared with placebo. Among women who reported no prior use of hormone therapy, the relative risk of invasive breast cancer was 1.09, and the absolute risk was 40 versus 36 cases per 10,000 women-years for CE plus MPA compared with placebo. In the same substudy, invasive breast cancers were larger, were more likely to be node positive, and were diagnosed at a more advanced stage in the CE (0.625 mg) plus MPA (2.5 mg) group compared with the placebo group. Metastatic disease was rare, with no apparent difference between the two groups. Other prognostic factors, such as histologic subtype, grade and hormone receptor status did not differ between the groups6[see Clinical Studies (14.2)]. The WHI estrogen plus progestin substudy reported a statistically non-significant increased risk of ovarian cancer. After an average follow-up of 5.6 years, the relative risk for ovarian cancer for CE plus MPA versus placebo was 1.58 (95 percent CI, 0.77-3.24). The absolute risk for CE plus MPA versus placebo was 4 versus 3 cases per 10,000 women-years.7A meta-analysis of 17 prospective and 35 retrospective epidemiology studies found that women who used hormonal therapy for menopausal symptoms had an increased risk for ovarian cancer. The primary analysis, using case-control comparisons, included 12,110 cancer cases from the 17 prospective studies. The relative risks associated with current use of hormonal therapy was 1.41 (95% confidence interval [CI] 1.32 to 1.50); there was no difference in the risk estimates by duration of the exposure (less than 5 years [median of 3 years]vs. greater than 5 years [median of 10 years] of use before the cancer diagnosis). The relative risk associated with combined current and recent use (discontinued use within 5 years before cancer diagnosis) was 1.37 (95% CI 1.27 to 1.48), and the elevated risk was significant for both estrogen-alone and estrogen plus progestin products. The exact duration of hormone therapy use associated with an increased risk of ovarian cancer, however, is unknown. After an average follow-up of 5.2 years, 28 women in the estrogen-alone group and 19 women in the placebo group were diagnosed with probable dementia. The relative risk of probable dementia for CE-alone versus placebo was 1.49 (95 percent CI, 0.83-2.66). The absolute risk of probable dementia for CE-alone versus placebo was 37 versus 25 cases per 10,000 women-years 8 [see Use in Specific Populations (8.5), and Clinical Studies (14.3)]. In the WHIMS estrogen plus progestin ancillary study, a population of 4,532 postmenopausal women 65 to 79 years of age was randomized to daily CE (0.625 mg) plus MPA (2.5 mg) or placebo. After an average follow-up of 4 years, 40 women in the CE plus MPA group and 21 women in the placebo group were diagnosed with probable dementia.The relative risk of probable dementia for CE plus MPA versus placebo was 2.05 (95 percent CI, 1.21-3.48). The absolute risk of probable dementia for CE plus MPA versus placebo was 45 versus 22 cases per 10,000 women-years8[see Use in Specific Populations (8.5), and Clinical Studies (14.3)]. Menostar was investigated in a 2-year double blind, placebo-controlled, multicenter study in the United States. A total of 417 postmenopausal women (208 women on Menostar, 209 on placebo) 60 to 80 years old, with an intact uterus were enrolled in the study. At 24 months, 189 women remained in the Menostar group and 186 remained in the placebo group. Adverse events with an incidence of ≥5 percent in the Menostar 14 mcg group and greater than those reported in the placebo group are listed in Table 1. In vitro and in vivo studies have shown that estrogens are metabolized partially by cytochrome P450 3A4 (CYP3A4). Therefore, inducers or inhibitors of CYP3A4 may affect estrogen drug metabolism. Inducers of CYP3A4 such as St. John’s wort (hypericum perforatum) preparations, phenobarbital, carbamazepine, and rifampin may reduce plasma concentrations of estrogens, possibly resulting in a decrease in therapeutic effects and/or changes in the uterine bleeding profile. Inhibitors of CYP3A4 such as erythromycin, clarithromycin, ketoconazole, itraconazole, ritonavir and grapefruit juice may increase plasma concentrations of estrogens and may result in side effects. Menostar should not be used during pregnancy [see Contraindications (4)]. There appears to be little or no increased risk of birth defects in children born to women who have used estrogens and progestins as oral contraceptives inadvertently during early pregnancy. A total of 417 postmenopausal women 61 to 79 years old, with an intact uterus, participated in the osteoporosis trial. More than 50 percent of women receiving study drug, were 65 years of age or older. Efficacy in older (≥ 65 years of age) and younger (<65 years of age) postmenopausal women in the osteoporosis treatment trial was comparable both at 12 and 24 months. Safety in older (≥ 65 years of age) and younger (<65 years of age) postmenopausal women in the osteoporosis treatment trial was also comparable throughout the study. Since both ancillary studies were conducted in women 65 to 79 years of age, it is unknown whether these findings apply to younger postmenopausal women8[see Warnings and Precautions (5.3), and Clinical Studies (14.3)]. 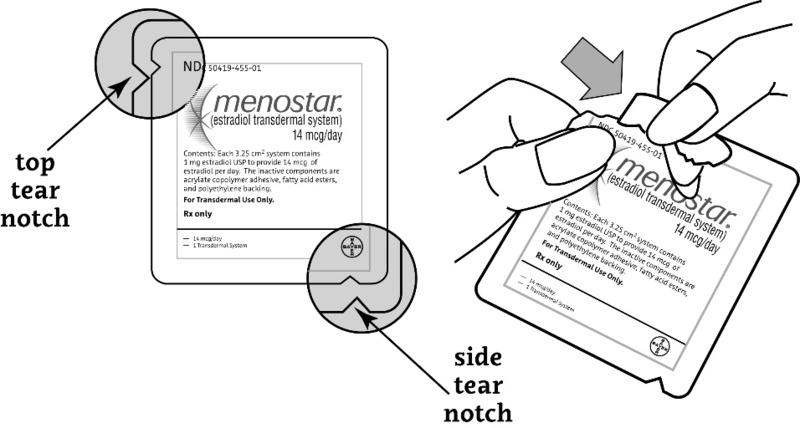 Menostar (estradiol transdermal system) is designed to provide nominal in vivo delivery of 14 mcg of estradiol per day continuously upon application to intact skin. The period of use is 7 days. The transdermal system has a contact surface area of 3.25 cm2, and contains 1 mg of estradiol USP. The bioavailability of estradiol following application of a Menostar transdermal system, relative to that of a transdermal system delivering 25 mcg per day, was investigated in 18 healthy postmenopausal women, mean age 66 years (range 60 to 80 years). The mean serum estradiol concentrations upon administration of the two patches to the lower abdomen are shown in Figure 1. 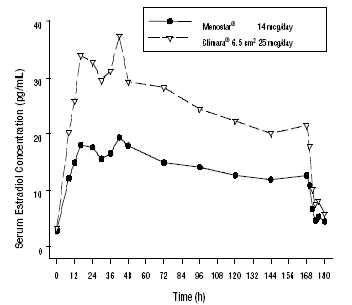 Transdermal administration of Menostar produced geometric mean serum concentration (Cavg) of estradiol of 13.7 pg/mL. No patches failed to adhere during the one week application period of both transdermal systems. Following application of the Menostar transdermal system to the abdomen, it is estimated to provide an average nominal in-vivo daily delivery of 14 mcg estradiol per day. Pharmacokinetic parameters are expressed in geometric means except for the Tmax which represents the median estimate and the Cmin which is expressed as the arithmetic mean. The estimated estradiol daily delivery rate for Climara 6.5 cm2 is quoted from the Climara labeling. The efficacy of Menostar in the prevention of postmenopausal osteoporosis was investigated in a 2-year double blind, placebo-controlled, multicenter study in the United States. A total of 417 postmenopausal women, 60 to 80 years of age, with an intact uterus were enrolled in the study. All patients received supplemental calcium and vitamin D.
At lumbar spine Menostar increased BMD by 2.3 percent after 1 year and 3 percent after 2 years compared with a 0.5 percent increase after 1 and 2 years of treatment with placebo. At the hip Menostar increased BMD by 0.9 percent after one year and 0.84 percent after two years compared with a mean decrease of 0.22 percent after 1 year and 0.71 percent after 2 years of placebo treatment. The changes in BMD from baseline were statistically significantly (p <0.001) greater during treatment with Menostar than during treatment with placebo for both the spine and hip after 1 and 2 years (Table 3). n = number of patients with data available for each variable. For those outcomes included in the WHI "global index" that reached statistical significance, the absolute excess risks per 10,000 women-years in the group treated with CE-alone was 12 more strokes, while the absolute risk reduction per 10,000 women-years was 7 fewer hip fractures.9 The absolute excess risk of events included in the "global index" was a non-significant 5 events per 10,000 women-years. There was no difference between the groups in terms of all-cause mortality. Centrally adjudicated results for stroke events from the estrogen-alone substudy, after an average follow-up of 7.1 years, reported no significant difference in the distribution of stroke subtype and severity, including fatal strokes, in women receiving estrogen-alone compared to placebo. Estrogen-alone increased the risk of ischemic stroke, and this excess risk was present in all subgroups of women examined.10 See Table 5. The WHI estrogen plus progestin substudy was stopped early. According to the predefined stopping rule, after an average follow-up of 5.6 years of treatment, the increased risk of invasive breast cancer and cardiovascular events exceeded the specified benefits included in the "global index". The absolute excess risk of events included in the “global index” was 19 per 10,000 women-years. A subset of the events was combined in a "global index”, defined as the earliest occurrence of CHD events, invasive breast cancer, stroke, pulmonary embolism, endometrial cancer, colorectal cancer, hip fracture, or death due to other causes. After an average follow-up of 5.2 years, the relative risk of probable dementia for CE-alone versus placebo was 1.49 (95 percent CI, 0.83-2.66). The absolute risk of probable dementia for CE-alone versus placebo was 37 versus 25 cases per 10,000 women-years. Probable dementia as defined in the study included Alzheimer’s disease (AD), vascular dementia (VaD) and mixed types (having features of both AD and VaD). The most common classification of probable dementia in the treatment group and the placebo group was AD. Since the ancillary study was conducted in women 65 to 79 years of age, it is unknown whether these findings apply to younger postmenopausal women [see Warnings and Precautions (5.3), and Use in Specific Populations (8.5)]. After an average follow-up of 4 years, the relative risk of probable dementia for CE plus MPA versus placebo was 2.05 (95 percent CI, 1.21-3.48). The absolute risk of probable dementia for CE plus MPA versus placebo was 45 versus 22 cases per 10,000 women-years. Probable dementia as defined in the study included AD, VaD and mixed types (having features of both AD and VaD). The most common classification of probable dementia in the treatment group and the placebo group was AD. Since the ancillary study was conducted in women 65 to 79 years of age, it is unknown whether these findings apply to younger postmenopausal women [see Warnings and Precautions (5.3), and Use in Specific Populations (8.5)]. Store at 20°C to 25°C (68°F to 77°F); excursions permitted between 15°C and 30°C (59°F°F and 86°F). Do not store above 86°F (30°C). Inform postmenopausal women of the importance of reporting vaginal bleeding to their healthcare provider as soon as possible [see Warning and Precautions (5.2)]. Inform postmenopausal women of possible serious adverse reactions of estrogen-alone therapy including Cardiovascular Disorders, Malignant Neoplasms, and Probable Dementia [see Warnings and Precautions (5.1, 5.2, 5.3)]. If you use MENOSTAR only to prevent osteoporosis due to menopause, talk with your healthcare provider about whether a different treatment or medicine without estrogens might be better for you. See the list of ingredients in MENOSTAR at the end of this leaflet. 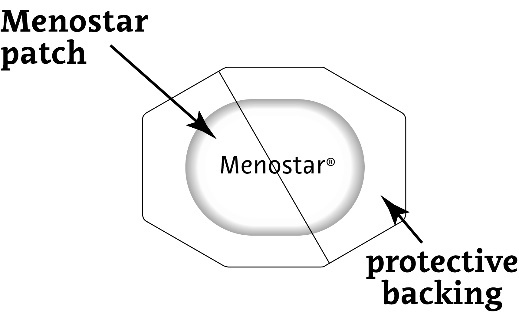 General information about the safe and effective use of MENOSTAR. 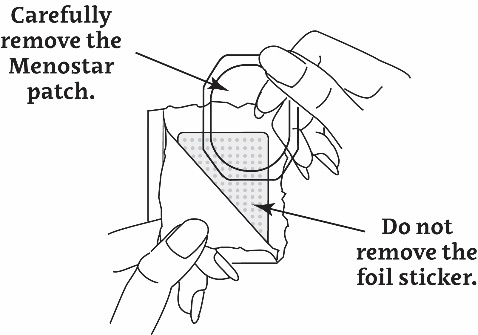 Inactive ingredients: acrylate copolymer adhesive, fatty acid esters, and polyethylene backing. © 2013, Bayer HealthCare Pharmaceuticals Inc. All rights reserved.